You’d swear their work was created in a wood paneled commercial art office. India ink heavy in the air, piles of paper filled with sketches, and busy artists at sturdy wooden desks using ink brushes, rollerballs and nib pens. So what’s the secret to creating authentic commercial art illustrations? Here’s a hint: inconsistency and human imperfection. Adobe Illustrator has given us the ability to create precision artwork. The problem is that it cost us the human touch that adds warmth to illustrations, for example expression filled ink strokes with varying weights and subtle imperfections. • Gathered a huge library of commercial art from the 40s and 50s. • Studied how these pens perform in the real world. We paid close attention to things like: how the ink pools when a nib pen first touches the paper, how brush strokes widen as pressure increases and decreases, how the end of strokes terminate. • Carefully recreated these characteristics in vector form. We used real commercial art samples, strokes we created with brush and nib pens and even created ink strokes with the pen tool using historical reference material. The bottom line is we created the pen set that we’ve always dreamed of. You see, most Adobe Illustrator brush packs are made by scanning pen strokes, auto-tracing them and making them into brushes. The result is hard to use brushes that give less than stellar results. 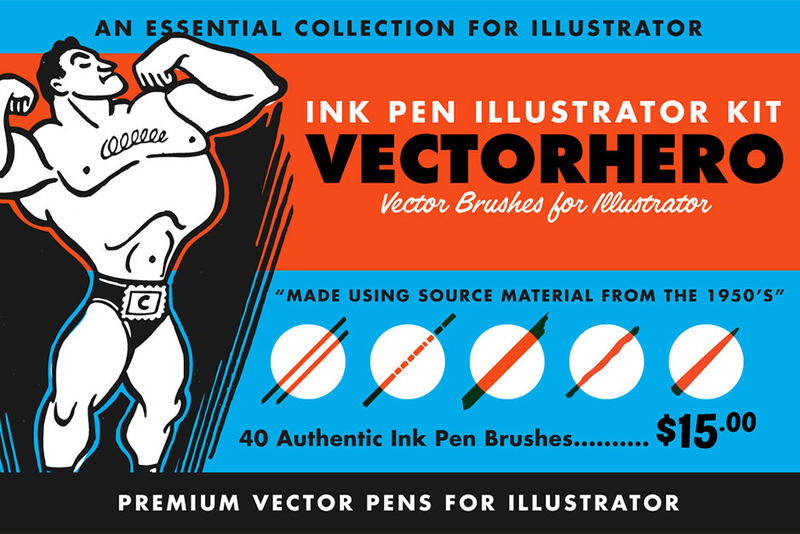 Scott Fuller and Dustin Lee spent over 40 hours compiling material, studying the best examples of commercial illustration work, recreating and refining brushes and then testing them by creating real artwork in the classic style of 1950s illustrations. The result is a pack of brushes that we love using in our work. We think you’ll love them too. Software requirements: Adobe Illustrator CS4 and newer. File size is approx 8.2MB (8.9MB unzipped), offered as a single download.